Highway projects in Arizona, Georgia, Maine, Missouri, Oregon and Virginia have been chosen for Federal Highway Administration Highways for LIFE program grants for 2007. The states will receive up to $1 million each to use innovations to cut construction congestion while enhancing safety, quality and user satisfaction. These states are the first round of 2007 recipients. 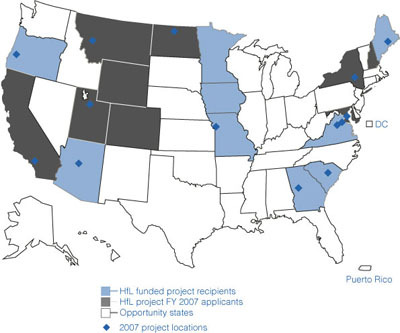 More states are expected to receive HfL grants in the coming months. While each project has a unique approach, they all reflect the desire of the state highway agency to provide citizens with a better driving experience. Innovations range from European-inspired roundabouts that are a safer alternative to traditional intersections to prefabricated pavement slabs that can be installed like tiles overnight to contracting techniques that save time and money.To qualify for HfL incentive funding, projects must use innovative design or construction approaches that states have rarely used before and provide good opportunities for technology transfer. Projects must also include performance goals that define desired results in safety, construction congestion, quality and user satisfaction. Nine states chose innovations to help meet customer-focused goals in 2006 and 2007 Highways for LIFE projects. The Arizona Department of Transportation will use its grant to reconstruct a section of State Route 179 in Sedona. The project includes construction of six roundabouts—circular intersections with design and traffic control features to improve traffic flow and safety—and a prefabricated bridge. It also features innovative contracting with incentive and disincentive clauses. The project team set a goal of maintaining 100 percent access to area businesses and residences during construction, a priority identified by the community. The project is expected to reduce fatalities and injuries by 20 percent compared to preconstruction. It is also expected to reduce pavement noise and enhance ride quality. The Georgia DOT’s project to build a new interchange on Interstate 85 in Troup County will use a design-build approach that requires contractors to meet performance measures with their bids. Bidders will also be encouraged to use innovative materials and technologies, such as prefabricated bridge elements. Project goals to lessen traffic congestion resulting from construction include reducing construction time by 40 percent through contractor incentives and clearing work zone incidents not involving injuries in less than 20 minutes. The Maine DOT will use full-road closures to accelerate construction and reduce the impact on drivers when it replaces two bridges, one on State Highway 116 in Old Town and the other on Route 4 in Addison. By using precast, prestressed concrete superstructures, built offsite in a controlled. Among the agency’s goals are an 80 percent reduction in construction time and zero work zone injuries. The shortened schedule will allow the work to be completed over the summer to avoid long detours for school buses. The Missouri DOT will rebuild a section of I-29/I-35 in Kansas City to increase capacity, improve safety and upgrade the Missouri River crossing. The project will use fixed-price, design-build contracting to encourage innovation in design, traffic management and construction phasing. 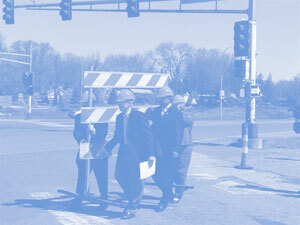 FHWA Minnesota Division Administrator Tom Sorel, Minnesota DOT Metro District Engineer Khani Sahebjam, Minnesota Lieutenant Governor/DOT Commissioner Carol Molnau and an unidentified man move a barrier into place at a May ceremony to close part of Highway 36 for rapid reconstruction. The proposed work is designed to meet goals for ride and noise quality. The agency will require the contractor to develop a quality management system for the project and maintain a quality assurance staff. A community advisory group will meet with project leaders to identify public priorities for the project, such as bridge aesthetics. The Oregon DOT will use prefabricated bridge elements made with high-performance concrete when it replaces five bridges on Oregon 38 between Drain and Elkton. Formulated for enhanced durability and strength, high-performance concrete offers a cost-effective solution for increasing infrastructure life and reducing maintenance. The agency will accelerate replacement of the five bridges by moving the prefabricated structures into place overnight with computer-controlled, self-propelled modular transporters. The goal is to minimize disruption to the traveling public and freight carriers by avoiding use of a 50-mile detour. The Virginia DOT will use precast, prestressed concrete slabs to repair a two-lane ramp on I-66 at US 50 in Fairfax County. To minimize traffic disruptions, the work will be done at night and one lane and shoulder will be replaced at a time. Using prefabricated slabs and nighttime lane closures is expected to cut construction time from more than 100 days to 35 nights. Integrated intelligent transportation systems technologies will be used to improve traffic flow and safety in the work zone. In another Virginia project, a prefabricated bridge superstructure will be used to replace a bridge on Route 15/29 in Prince William County. The bridge project will use innovative contracting with incentives and disincentives. It will also use a rapid construction method by limiting traffic to one lane at night while work is completed, reducing impact on drivers a projected 80 percent. In 2006, Iowa, Minnesota and South Carolina received HfL grants for projects that incorporate innovations. Iowa is reconstructing an interchange in Council Bluffs using prefabricated bridge sections built away from the roadway and installed overnight, sparing drivers months of onsite roadwork. Minnesota is rebuilding part of Highway 36 in North St. Paul using a full-road closure for five months to complete the project faster. South Carolina inserted a “no excuses” clause in a construction contract for meeting the specified completion date for a bridge project in Kingstree. For more information, contact Mary Huie at (202) 366-3039 or mary.huie@dot.gov or visit www.fhwa.dot.gov/hfl. Innovation makes it possible to accomplish this mission. Seeking the best methods, materials, processes, procedures and equipment to design, construct and operate highways will provide superior service. But how does one go about becoming innovative? The typical highway community worker may not perceive himself or herself as being inventive, creative or freethinking. But being inventive is part of human nature. It just needs to be turned on. As author Marcel Proust put it, “The voyage of discovery is not in seeking new landscapes but in having new eyes.” To look at a task with new eyes takes a desire or need and a supporting or enabling culture. An innovative business culture conveys the loud-and-clear message that looking for a better way to do your job is part of what you are paid for. And it is not wasting time to stop and say “I think this can be done better, faster and/or less expensively,” and then make that thought a reality. Certainly this culture exists in the technology industry. 3M is often cited as an example of a company that encourages innovation. The story of how Post-It® Notes evolved from one employee’s discovery of a reusable adhesive and another’s need for page markers for his choir hymnal has become legend. But what about the highway community? The New Mexico Department of Transportation has an innovative culture that reaches all the way down to its highway maintenance crews, who have developed equipment to help them do their jobs better. Among their innovations are a guardrail post puller that removes damaged posts quickly and safely, an asphalt oven that uses truck exhaust to keep asphalt patching material warm in cold weather, and a self-contained concrete repair truck that enables them to fix roads more efficiently and less expensively. As the New Mexico DOT shows, one step in being innovative is for highway community leadership to send the loud-and-clear message that being innovative is valued and necessary and that it will be recognized and celebrated. For innovation to contribute significantly to the success of a highway agency’s mission, however, it also must be focused. Highway customers are motorists, other highway users and neighbors. Several recent surveys of these customers have indicated that their highest priorities are smoother, safer roads and less congestion. A tool to help the highway community focus innovation on smoother, safer, less-congested highways is performance goals. That’s why the HfL program encourages performance goals for safety during and after construction, reduced construction congestion, and improved ride quality that results in less maintenance and improved user satisfaction. The HfL team now offers state DOTs workshops that focus on being innovative through seeking the best solutions and setting performance goals (see “FHWA Launches HfL Workshop”). Setting performance goals is a key element of creating an innovative culture in the highway community. Goals that require a stretch, but are still achievable, will drive the use of the best solutions. Information on innovations used in New Mexico and other states is on the American Association of State Highway and Transportation Officials’ Quality Information Center website at www.transportation1.org/quality/practices.htm. Charles Churilla is a highway industry consultant and was the first FHWA Highways for LIFE team leader. A TIG team is promoting installation of cable median barriers as a cost-effective way to prevent crossover crashes. A new Highways for LIFE workshop is designed to help states consistently deliver transportation projects that delight their ultimate customers: the traveling public. The purpose of the one-day “Seeking the Best Solutions” workshop is to enable states to develop a process for setting customer-focused performance goals and incorporating innovations and best solutions into highway projects. The HfL workshop is modeled after the Federal Highway Administration’s “Accelerated Construction Technology Transfer” workshop, in which participants identify ways to cut construction time and work zone congestion on projects. In fact, the HfL workshop can serve as a precursor to an ACTT or “Performance Contracting Framework” workshop. Designed to support the HfL program mission to improve the American driving experience, an HfL workshop can focus on general, program-level project delivery or specific projects, including those for which a state is considering seeking HfL funding. It can be tailored to one state’s needs or include participants from several states in a region. At a typical workshop, participants will explore setting measurable, customer-focused project goals that stretch the highway agency and push it to use innovations that benefit taxpayers and motorists. Participants will identify and evaluate innovations that enhance quality and safety and reduce construction congestion to determine the best solutions for projects. They’ll also discuss why and how to use performance contracting and other innovative contracting techniques. Workshop participants will include representatives of FHWA division offices and state agency departments involved in project planning and construction. One of the TIG’s 2007 focus technologies is the self-propelled modular transporter, a computer-controlled platform vehicle that can move a bridge structure. While the casual observer may think few innovations remain when it comes to roadways and materials, those closer to the ground realize there’s always room for improvement. The American Association of State Highway and Transportation Officials’ Technology Implementation Group is at the forefront of putting such advances into common practice. 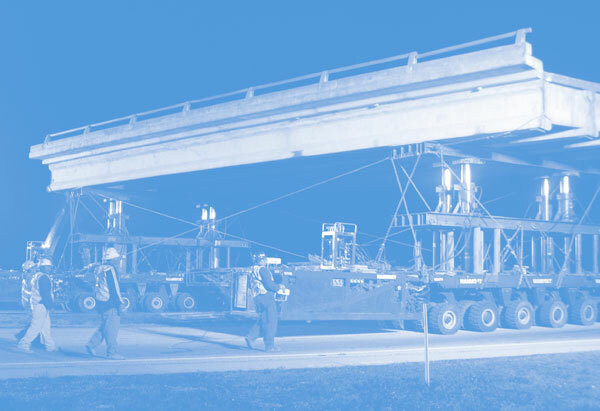 Since its founding in 2000, AASHTO’s TIG has been instrumental in moving ready-to-use technologies into broader use by state transportation departments. TIG teams are now promoting six focus technologies and are planning a marketing push for another two. The TIG was created with the passage of the Strategic Highway Research Program, which was funded as part of the Intermodal Surface Transportation Efficiency Act. It is made up of a joint task force of AASHTO’s Standing Committee on Highways and Standing Committee on Research. 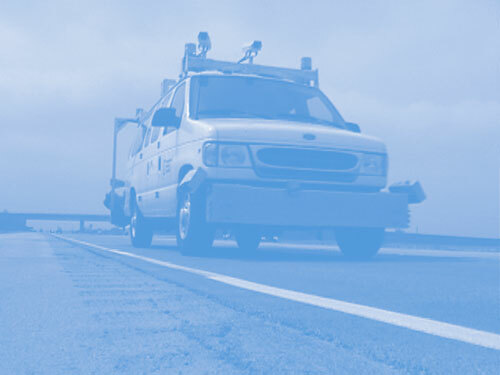 The group is a unique partnership of AASHTO’s member state transportation agencies, the Federal Highway Administration and organizations representing agencies engaged in highway maintenance and construction. Each year, it identifies two to four technologies that are ready for implementation and markets them for accelerated adoption by federal, state and local transportation departments. The TIG is similar to the FHWA Highways for LIFE program in that it promotes rapid implementation of innovations that are readily available but not frequently used. Many TIG technologies support the HfL goal of encouraging use of innovations that reduce construction congestion while enhancing safety, quality and user satisfaction. Each year, the TIG also identifies “additionally selected technologies” to promote as a group. This year’s are slope stabilization using recycled plastic reinforcement, embedded data collectors that allow long-term monitoring of foundation piles, and low-profile barrier systems to improve visibility and safety in work zones. Earlier TIG selections already having an impact in states across the country include fiber-reinforced polymer repair of aluminum overhead sign structures, thermal imaging of commercial vehicle brakes to detect safety problems, and air void analyzers to test fresh concrete on construction sites. Other TIG technologies enjoying wider use are GPS technology for surveying pavement condition and inventorying highsday assets, prefabricated bridge elements to speed up bridge replacement projects, accelerated construction technology transfer, and intelligent transportation systems in work zones. Nominations for innovative technologies come from state and local transportation departments and AASHTO and FHWA organizational units. AASHTO will seek applications for 2008 technologies in fall 2007. For more information, contact Keith Platte, AASHTO’s program manager for engineering, at kplatte@aashto.org or visit tig.transportation.org. Nothing grabs motorists’ attention like a bumpy road. Highway agencies, well aware of this phenomenon, began setting performance goals for pavement smoothness in the 1980s. Most state highway agencies now use profilometers to measure pavement smoothness and assure motorists a comfortable ride. Over time, the performance goals were reached and then raised as the technology used to achieve the goals advanced. As a result, the goals have been instrumental in improving the way pavements are built and satisfying motorists’ desire for a smoother ride. Early on, many highway agencies adopted the California Department of Transportation’s profilograph equipment and test method, the most innovative technology available in the 1980s. The California profilograph is a 25-foot-long (7.6-meter-long) rolling straight edge that uses a centrally mounted wheel to measure bumps and dips in the pavement surface. The bumps and dips exceeding a threshold or bandwidth are added up over 0.10 mile (0.16 kilometer) to produce a profile index for that section. The lower the profile index, the smoother the road and the better the ride. Using the profilograph and profile index, highway agencies were able to establish and measure a performance goal for pavement smoothness that could be included in construction contracts. Highway agencies found that pavements built under a profilograph specification were smoother and rode better, but the ride was still not as good as motorists demanded. Agencies began specifying an even lower profile index and narrowing or eliminating the bandwidth in calculating the profile index. Pavements built under these second-generation profilograph specifications got smoother, but they still weren’t as smooth as they could be. Highway agencies had taken the profilograph specification as far as it could go. The required specification to build even smoother pavements exceeded the capability of the profilograph to measure the true profile of the road surface. The next step was the profilometer, an innovation that uses noncontact sensors and computer technology to accurately measure the pavement profile and calculate an International Roughness Index. As with the profile index, a lower IRI means a smoother pavement, but IRI is a much better indicator of the ultimate ride quality than the profile index. Performance goals helped turn the quest for smoother pavements into a success story. Today most state highway agencies set their pavement smoothness performance goals using IRI measured by low-cost profilometers. Pavements that meet these goals provide the smoothest ride for highway users. Highway agencies also benefit because, as the Federal Highway Administration’s Long-Term Pavement Performance Program has documented, smoother pavements last longer and perform better. For more information, go to /pavement/smoothness/index.cfm. Illustration showing innovation and meeting targets on a city street. The Highways for LIFE program uses performance goals to stimulate innovation and creativity in developing highway projects that will yield big payoffs in the areas of safety, construction congestion, quality and user satisfaction. The Federal Highway Administration made performance goals part of the HfL program to emphasize the needs and desires of highway users, to foster acceptance and implementation of innovations, and to reinforce the need to address safety, congestion and quality in every project. Performance goals define the results a project should achieve, an approach that differs from past FHWA programs that offered incentives to states to build projects that incorporated specific innovations or technologies. The HfL performance goals, spelled out in the program’s implementation plan, are set at a level that represents the best rather than the average or lowest common denominator that the highway community can achieve. Each highway project that state agencies submit for HfL incentive funding must address all of the performance goals unless the project has unique circumstances that negate the application of a specific goal. A successful performance goal fulfills several requirements. It must clearly define the desired outcome or result for the responsible group, such as the transportation agency, design consultant or construction company, and the ultimate customer, the highway user. The performance goal must also be communicated to management, the workforce and the customer. Goals provide the highway agency and construction company with a focus as they design and build the project. Communicating progress toward goals to the public boosts the credibility of and support for the highway agency. In addition, the performance goal should encourage those developing projects to think about new and better ways of doing their jobs. The goal should seek a significant change or improvement, typically 10 to 20 percent or more. Change in this range gets attention and conveys the message that the job needs to be done differently than in the past. Also, performance goals specifying changes of less than 5 percent may be difficult to evaluate with available measurement systems. See “Pavement Smoothness” in this issue of Innovator for a performance goal success story. Future issues will explore performance goal concepts, processes, initiatives and more success stories.